The other weekend, my boyfriend and I found ourselves eating Indian food, a cuisine neither of us had tasted in a while. Needless to say, the meal was a HUGE success leaving both of us craving for more. To satisfy our hunger I ventured into kitchen to try my cooking skills within the Indian cuisine realm and tackle DC 100 list item Aloo Gobi. First and foremost was finding a cookbook to guide me in this foreign and often times complicated and time-consuming cuisine. Film actress Madhur Jaffrey has authored numerous cookbooks focusing on Indian food, great buys if you’re interested in exploring the cuisine, so at my uncle’s recommendation I turned to the book Madhur Jaffrey Indian Cookery for her recipes and guidance. For aloo gobi, the core ingredients are (duh!) aloo and gobi, translated from Hindi: potatoes and cauliflower. These simple and bland vegetables when combined with vegetable oil, 3 types of cumin (cumin seed, ground cumin, ground cumin-roasted,) coriander, ground turmeric, chopped green chile, salt and pepper become a deliciously, mildly spicy (and I’m weak when it comes to spiciness) vegetarian dish. The boiled, skinless potatoes softly crumble and melt in your mouth. The cauliflower remains crunchy, and easily absorbs and takes on the various Indian spices. It is texture contrast between the crunchy cauliflower and the slightly coarse potatoes that allows the spicing to develop with each bite. 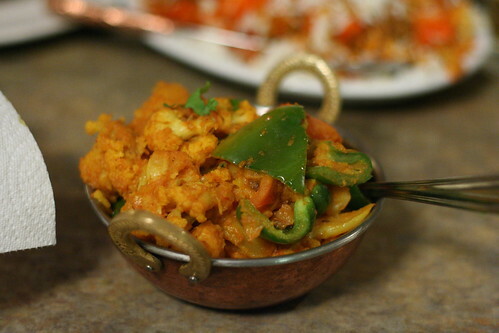 Aloo gobi is a typical, “homey” dish for most North Indians and is served without an accompanying sauce. For the veggies among us, aloo gobi is a stellar find and goes great with jasmine rice or nan bread. Personally, as a meat eater, I love having aloo gobi as a side dish, as it wonderfully compliments other perhaps spicier dishes, like chicken tikka masala or malai kofta. Hindu is someone who practices Hinduism. Hindi is the language. Great dish though, thanks for sharing. You are correct. Changing per your comment. Surely you mean “Hindi”, which is the language. hindoo, vindaloo, vodoo. its all good. anyone who can make aloo gobi from scratch is cooking with gas. where did you go? I never understood the term “naan/nan bread” or “chai tea”…it’s like calling spaghetti “spaghetti pasta”. Get a DVD of Bend It Like Beckham. It has a wonderful featurette, “Who Wants to Cook Aloo Gobi?” in which writer-director Gurinder Chadha cooks Aloo Gobi under the disapproving eyes of older female relatives. Wonderful and funny.